The boss of British carmaker Bentley says Brexit is a killer and poses a fundamental risk to the profitability of his business. "If we ended up with a hard Brexit ... that would hit us this year because we do have potential to get beyond break-even to do the turnaround," Adrian Hallmark told Reuters. "It would put at fundamental risk our chance of becoming profitable." On Tuesday it emerged Brexit-backing businessman Sir James Dyson was relocating his firm’s head office from the UK to Singapore. 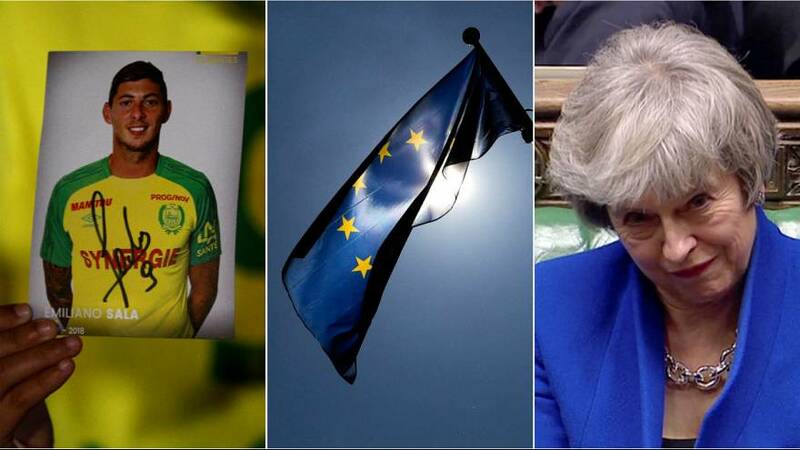 British Prime Minister Theresa May faces MPs’ questions later on Wednesday, with her struggling Brexit deal likely to be high on the agenda. MPs will vote on her EU divorce deal on Monday, January 29, exactly two months before the UK is due to leave the bloc. British police say their search for missing footballer Emiliano Sala is focussing on the possibility he and his pilot are on a life raft in the English Channel. The plane Sala was travelling on has not been seen and lost radar contact on Monday evening. Rescue planes resumed searches on Wednesday morning. Police also said it's possible Sala and his pilot had been picked up by a ship but had not yet made contact with authorities. They said the plane could have landed elsewhere or that the plane broke up and left the pair in the sea. The EU’s chief Brexit negotiator said the current backstop proposal for Ireland is the only one on the table. Some of the Conservative MPs who voted down Theresa May’s Brexit deal last week want a time limit put on the backstop, which is an insurance policy for Brussels to avoid the return of a physical border on the island of Ireland. "The question of limiting the backstop in time has already been discussed twice by European leaders. This is the only possible option because insurance is of no use if it is time limited," Barnier said in an interview with newspapers Le Monde, Rzeczpospolita and Luxemburger Wort. Brussels is set to issue a warning over EU countries selling citizenship or residence permits to wealthy individuals. The European Commission is concerned this offers a way for foreign, organised crime groups to infiltrate the bloc. Malta, Cyprus and Bulgaria are the only EU countries that run schemes selling citizenship, while 20 states offer residence permits. Passports allow individuals unhindered access to most EU countries. Bulgaria said on Tuesday that it plans to stop selling citizenship in return for investment in the country. Matteo Salvini says he hopes the French won’t back President Emmanuel Macron’s party in May’s European Parliament elections. The comments by Italy’s deputy prime minister will likely deepen a row between the two neighbouring countries. On the weekend Italy’s other deputy PM, Luigi Di Maio, accused Paris of creating poverty in Africa and generating mass migration to Europe. Di Maio’s broadside prompted Paris to summon Italy’s ambassador to France to discuss the controversy. Earlier in January Salvini visited Poland to discuss forming a eurosceptic alliance ahead of May’s elections.